Folks, who aim to explore authentic Far East fare in Dubai such as Korean food, should pay a visit to Seoul Garden Restaurant in Al Karama region of Dubai because it is as authentic as one can expect. The setting of this bistro is quite simple, as it has adopted basic Asian style of decor. However, the Korean food served at this site is absolutely amazing and delicious and it will take the guests far away from this venue with its splendid taste and aroma. The menu of Seoul Garden includes various dishes made from different meats and fish plus there are soups and appetizers too on the list. Prices are also reasonable therefore it makes a terrific place to relish authentic Korean food for people of Dubai. Dishes made from cow’s intestine and feet are quite prominent in the carte du jour of this Korean eatery. However, those who are not interested in these dishes do not need to worry because there are plenty of other options which they can bask in such as fried fish, beef ribs, fried squid pancakes, steam rice, soups, appetizers and lot more. If this does not impress you then ask the waitress to set a bbq on your dining table, so you can cook one as per your liking. However, to do so one must be sure that he or she has what it takes to cook a delicious dish. Outdoor seating facility is also obtainable in this restaurant, as during cooler months of the year guests prefer to consume food in open air settings. In addition to this, customers can place take away orders at this eating place. 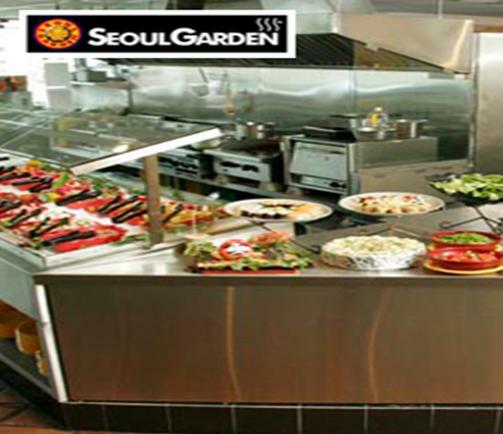 Seoul Garden Restaurant operates on all seven days of the week and its opening hours are from 6:00 pm to 11:30 pm. Za’abeel Road, Opposite Baby Shop, Karama, Dubai, United Arab Emirates. 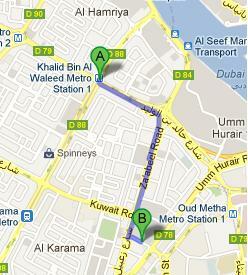 Khalid Bin Al Waleed Metro Station 1 is 1.9 kilometres away from Seoul Garden Restaurant. Pedestrians can cover this gap in about 24 minutes, if they head in the south course towards Khalid Bin Al Waleed Road/D 79 from this metro station. Then they have to make a slight left turn onto Khalid Bin Al Waleed Road/D 79, after which they should turn right onto Za'abeel Road/D 84 and later turn left while staying on Za'abeel Road/D 84. This will bring the pedestrians to a sharp left turn onto 27th Street from where destination is not too far and can be spotted on the right side after covering some distance. Umm Hurair, Road 1 1 – Dubai bus stop is 290 meters walking journey from the Seoul Garden Restaurant and it can be completed in about 4 minutes time span. As far as the buses are concerned, people can use any of these bus numbers 10, 27, 91A, X28 or X94 to reach this bus stop. After that they should head southwest on Umm Hurair Road/D 78 towards 27th Street and then turn right onto 27th Street, where destination is to be found on the left side. See map for directions.